Stupid to be out in the boat in this weather. Lots of luck involved here. Lucky she was found, lucky she was found in a city like Seattle with the equipment and trained Pros to take care of her. Other places time and distance would have played a bigger part as well as facilities available . Very lucky. have a proper boat, have a life vest, CHECK THE WEATHER REPORT. Side Note: Back in the late 70's when I was just a youngster in (back then) the "Inhalation Therapy Dept" in Portland Oregon there were several of us that were or had been involved in SAR and being in close proximity to Mt Hood where it was not uncommon for us to get hypothermic patients off the mountain. Being young, full of "can-do spirit" and interested in hypothermic resuscitation decided we were going to do something about it. There was a local Emergency Medicine/Cardiologist doc with some experience in Everest team medical management. We collaborated with him and developed a device called "Hot Oxygen Therapy" which consisted of a humidified, heated, closed-circle breathing circuit with a CO2 absorber and ability to add O2 into the circuit. We were able to monitor the circuit temperature and CO2 percentages and monitor the patients oxygen saturation level. The device was used via soft cushion mask held on via an anesthesia headset. (Today a Full Face CPAP mask would be perfect.) It was affectionately called the O2 Hotbox, was 10" square (footprint) and 14" tall. With the help and contacts of Dr Bangs, we started using them, in transporting patients from the mountain to our facility in both air and ground transport. And it was working. The 304 Air Evac started carrying one on each of their aircraft (Huey's) and eventually we had 10 in local service, and had good results in each case with core temp resuscitations down into the low 80's. My recollection was that we did resuscitate a late 30"s female that was down to 75 core temp. I don't remember the lowest temp, or a lot of the other details. (Moving someone with that low a core temp has to be done very carefully because of the increased likelihood Ventricular Fibrillation due to clod shock syndrome). The initial warming could be done with the patient in the initially found position, before major moving. The physiology was that inhaling warmed air (102 - 104 degrees) heated the core by having the warm air into the lungs and heating the blood thus warming the core. The warmed blood then perfused the body brain and periphery. It was faster than doing a peritoneal lavage with heated fluid, and less invasive so could be done in the field and during transport. The US Coast Guard would not use them on their rescue craft due to the fact they could not be submerged or inverted 180 degrees, but they did have some on their helicopters for a while. We made about 200 IIRC and had them placed in Iceland, Norway, Montana, Idaho, and UK. Back then, it was easier to do that sort of thing. Now, there would be way too many lawyers in the way. I moved from Portland so lost track of what happened to the "HotBox" project before it ended. So goes another "Back Then, Shoulda Woulda story. I remember these. USCG Astoria used them on their helos for a few years. They worked well, and were very highly regarded by the helo rescue folks. Lots of anecdotal support. Cameron Bangs, MD, was likewise an icon in the SAR groups, with high visibility getting out the word on hypothermia. Thanks for the contributions you guys made. I just read the story again and it gives a time of 3 AM??? why would anyone be out at that time of night?? I also have to wander if the paddle boat is really a paddle boat OR a peddle powered kayak? which would be a every so slightly better choice. I just read the story again and it gives a time of 3 AM??? why would anyone be out at that time of night? Because the bars had just closed? In one of the news spots I saw on that story they had a section of the story that included a photo of a Wherry type boat. Not really a "Paddle Boat" but a round chine, strong rockered shape, lapstraked hull, looked to be about 10 feet long. Very similar to this one. Doubtful that the water conditions looked anything like this one though. A little speculation: The woman was described as being from "Vashon Island", the boat was 15' long. 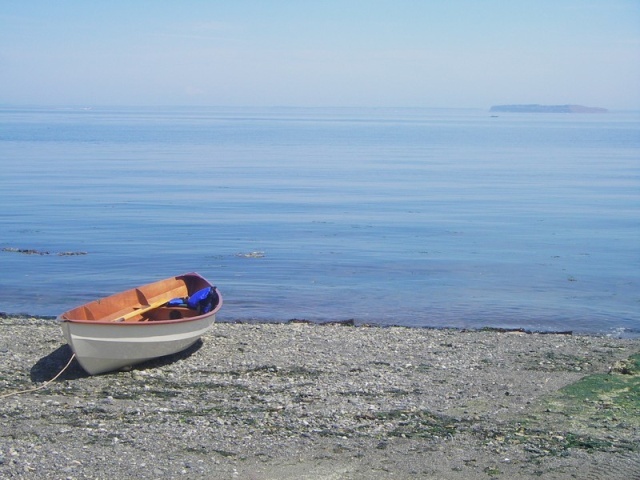 If truly a rowing vessel like a Wherry or true Dory vessel, could have they set off from Vashon Island some time earlier? It is not that far to Burien’s Seahurst Park. I suspect there is a lot more to the story than we are hearing. Agreed, they certainly should not have been out in any type of small craft, at night in those conditions! Maybe it's like that story of the kayakers in NY (near Tappan Zee bridge). Turns out the woman wanted to "off" the man and sabotaged the man's kayak. probably involved in the phenomenon at some point. Grandma used to say, "Going boating is optional. Returning home is mandatory." Foggy, I thought of that as a possibility too. The water was certainly cold enough, and she was young enough to be marginal for cold water shock syndrome. It will be interesting to see the recovery results. are pronounced "warm and dead". This time it was an accident. A well experienced kayaker, volunteer fireman with several years in at 2 different volunteer services. The accident involved hitting an underwater obstruction, the kayak flipped, and he didn't come out. May have been secondary to a head injury. He was with a group of several other kayakers on the north fork of the Snoqualmie River north of North Bend. Body was recovered about 2 miles downstream.